How do you strengthen historically black colleges and universities? By strengthening the pipeline of administrators to run them. At least that’s the solution being taken up a group of retired presidents of historically black institutions. 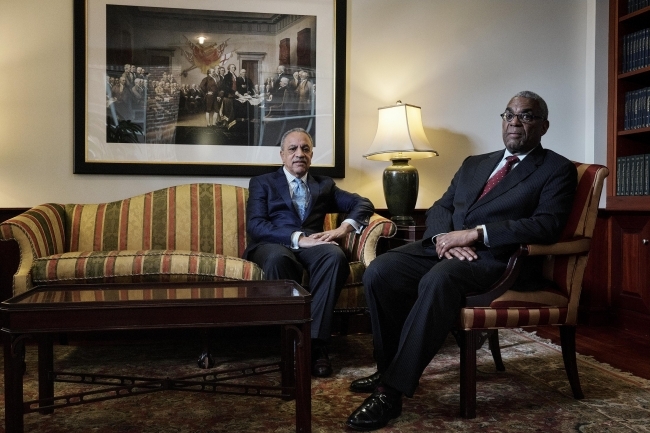 T.J. Kirkpatrick/Redux for The Chronicle John Garland, right, and Sidney Ribeau are among the four retired HBCU presidents starting an executive search firm for black college leaders. "We understand how lonely these jobs can be," says Mr. Garland. "And we also understand how important it is to have someone who you can call on for advice." On Tuesday, four former presidents are to announce the founding of TM2 Executive Search, a firm dedicated to identifying and placing candidates for top administration posts at HBCUs. TM2 , which is connected to the Thurgood Marshall College Fund, will be the first executive-search firm focused exclusively on HBCUs, and it arrives at a critical time. Many historically black institutions struggle to maintain enrollment, and public HBCUs face dwindling state support. Such pressures compound the challenges for leaders, and have contributed to "fairly significant turnover of leadership in the black-college community," according to John W. Garland, a former president of Central State University and executive chairman of TM2 . Mr. Garland and his colleagues hope to reverse the trend by recruiting solid candidates for HBCU leadership positions, and by offering guidance, and a sounding board, for up to a year for the new presidents and other leaders whom TM2 places. "We understand how lonely these jobs can be," he says. "And we also understand how important it is to have someone who you can call on for advice." TM2 also plans to work with boards of trustees to help them understand what they should be looking for in candidates, and to set realistic expectations for new leaders. This promises to be an important aspect of the firm’s services, given the number of bitter feuds between boards of trustees and new presidents at historically black institutions in recent years. If conflicts do arise within the first 12 months, "we can be a third party to mediate that discussion," Mr. Garland says. Wayne Watson and Dorothy Yancy, two of the new executive-search firm’s co-founders. "We’re looking for people who are prepared to come in, roll up their sleeves, and take our institutions to the next level," Ms. Yancy says. The need for a search firm that focuses on minority-serving institutions has been a topic of discussion in the HBCU community for years, according to Ms. Yancy and others. While many companies offer executive-search services to colleges, they are rarely deeply engaged with the HBCU community, she says, and "you don’t see a lot of diversity in terms of the principals and the folks involved in the searches." HBCUs not only have a different culture than majority-serving institutions, she continues, they might also differ in how they view prospective leaders. "We might look at the preparation level differently," she says. "We might look at the skill set differently." A commitment to improving historically black institutions could outweigh more traditional administrative résumé bullets. There have been a handful of organized efforts to improve the pool of black leaders, including the Higher Education Leadership Foundation, established last year. But talent-spotting and mentoring have been ad-hoc activities for many in the HBCU community, and TM2 offers a chance to add "a little structure" to such efforts, Ms. Yancy says. Walter M. Kimbrough, president of Dillard University, agrees with the need for a firm like TM2. Many executive-search firms don’t spend enough time "understanding the culture of the campus before they even go into the search process," he says — a problem not limited to searches at HBCUs, he adds. That failing sometimes leads to finalists who may bear impressive résumés but who don’t make good matches for the college in question. "You can see it coming a mile away," he says. "This person isn’t going to last, because they don’t fit with the culture of the institution." 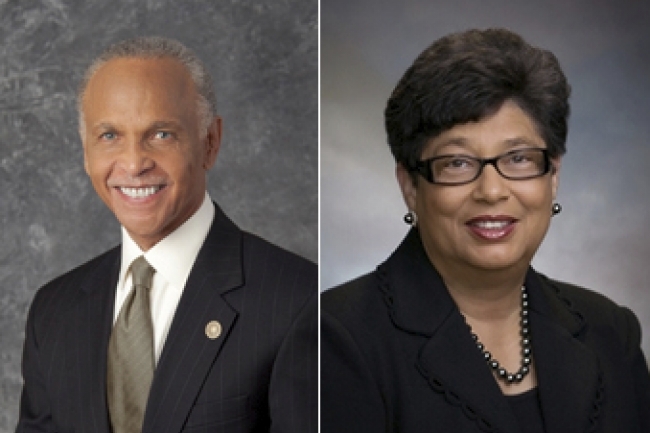 Clashes between boards and new presidents at HBCUs have become a staple of headlines. Three years ago, for example, Morgan State University’s Board of Regents tried to remove its president, David J. Wilson, after just three years. Mr. Wilson kept his position, though Dallas R. Evans, chairman of the board, lost his. Last fall Elmira Mangum, named president of Florida A&M University in 2014, survived a similar challenge. Rufus Montgomery, chairman of the university's Board of Trustees, stepped down in the aftermath. And it’s not just boards with whom presidents clash. Willie D. Larkin, the third president of Grambling State University in the past five years, received a vote of no confidence from the Faculty Senate last month after just seven months on the job. Mr. Kimbrough says the retired presidents involved in TM2 , given their decades of experience, are more likely to "know the right kind of questions to ask" during the search process. And they are more likely to be candid with boards about what the hiring process should be. A seasoned HBCU leader may be able to tell a board "this is the kind of leader that your institution needs, but that means that you’re going to have to operate a different way," Mr. Kimbrough says. "I don’t think there’s ever enough pushback on the board to say, ‘You’re part of the problem.’"
Such transitions can be especially difficult and painful when a new president comes in after a longtime leader, says Ms. Yancy. But that’s one of the reasons why TM2 emphasizes not just identifying nascent leaders, but also supporting the new leaders in their early months. "You can’t be like the stork and just drop the baby and leave it to flounder on its own," she says. The principals of TM2 face more challenges than deepening the talent pool. Marybeth Gasman, director of the Center for Minority-Serving Institutions, at the University of Pennsylvania, applauds the effort the presidents behind TM2 are making, and the experience they bring to it. But she notes that the job of college president has changed in just the past few years — social media alone has complicated it immensely — and that the veteran presidents might benefit from consulting with some sitting presidents. Mr. Kimbrough agrees, though he says future HBCU leaders face even bigger challenges. TM2 will be recruiting for leadership roles in an environment where enrollment competition and, especially, waning support for public institutions will make financial worries a continuing fact of life. He hopes TM2 can "identify some people who have been successful in this rapid de-escalation of state resources." Mr. Garland, the executive chairman, says that he and his colleagues all kept up with the new wrinkles, and new dilemmas, in college leadership. "It’s not like we’ve stepped away from the presidency and sat around and done nothing," he says. He also acknowledges the potential challenge of finding and recruiting rising administrators in a time when traditionally white institutions are eager to boost their hiring diversity. Competition against majority-serving colleges is something HBCU leaders "see every day, in everything that we do," he says. But HBCUs have long depended on students, faculty, and administrators who place foremost importance on the value of their mission. "Everybody who has talent is not dying to go work for a majority institution," says Ms. Yancy. "We’re looking for people who are prepared to come in, roll up their sleeves, and take our institutions to the next level." Lee Gardner writes about the management of colleges and universities, higher-education marketing, and other topics. Follow him on Twitter @_lee_g, or email him at lee.gardner@chronicle.com.